A sanctuary from the bustle of the city enter Susannah and relax in the haze of provencal lavender and iridescent light. Antique glass beads throw rainbows onto the beautiful collection of individually designed handmade bags, cushions, lined wicker baskets and sachets all made with antique and vintage fabrics collected over the last 25 years. In this ethereal shop find painted French furniture, decorative pieces, dolls, faded rose eiderdowns, quilts, French linens, floaty lace and passementerie to enchance the boudoir. Susannah Decorative Antiques and Textiles use all reasonable endeavours to ensure the accuracy and completeness of all the information on the Susannah Decorative Antiques and Textiles website. However, you should always verify any information on the website before making any decisions based on this information. We shall not be liable in any way for damages arising in contract, tort (including negligence) or otherwise in respect of loss or damage arising out of or in connection with your use of the Susannah Decorative Antiques and Textiles website. 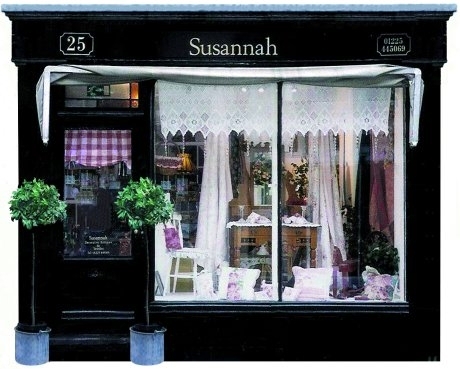 In no event will Susannah Decorative Antiques and Textiles be liable for any direct, indirect or consequential damages in contract or tort (including negligence), including loss of profit, loss or damage to property or relating to claims made by third parties. These terms and conditions shall be governed by and construed in accordance with the laws of England and Wales. Any disputes arising here from shall be exclusively subject to the jurisdiction of the courts of England and Wales.